Which kind of screen works well with a projector? When you want to give a high-class digital presentation in an educational or professional setting, you need a great projector screen. 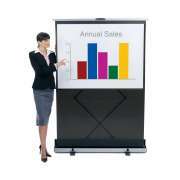 This one small piece of equipment can upgrade a whole seminar, creating an organized and efficient exhibition. 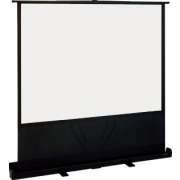 Projection screens can be used with a wide range of multimedia equipment including computers, overheads, slides and videos. Hertz Furniture&apos;s wide selection of portable screens includes a variety of options that can fit virtually any space. Whether presentations are taking place in a classroom, auditorium, social hall or boardroom, you can find the size and style that will suit the space perfectly. Putting together a presentation can take many hours of hard work. When professionals put so much effort into their work, they shouldn&apos;t have to compromise on a sub-par projection surface. While it is possible to project a movie or slideshow onto a regular wall or whiteboard, this arrangement poses potential complications. If the wall is dirty, this will interfere with the picture quality. Additionally, the glare from a dry erase board or a certain kind of paint can pose a distraction to people who are trying to focus on the pictures and text. 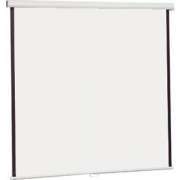 What kind of projector screen is good for a school? Most schools need to have projection capabilities in a number of different locations. If you want to have picture slideshows at graduations and ceremonies, a projection screen will be needed in the auditorium. When hosting special anti-bullying seminars for parents or professional development sessions for teachers, one will be required in the multipurpose room as well. With the increasing popularity of multimedia lessons, even a regular classroom will often require a clean surface. 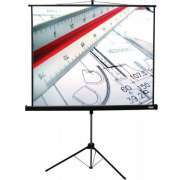 What kinds of projector screens are portable? There are a number of different ways to accommodate each location where a screen is desired. If a small number of units are needed on a regular basis in a variety of venues, tripod screens will make a great selection. These freestanding units are lightweight and versatile. They can be set up virtually anywhere and easily put away or transported to another location. Another mobile option is the tabletop screen. This arrangement does not require any floor space and is very compact when folded up. An added benefit of the tabletop style is that there is no need to be worried about the picture being blocked by furniture, since the screen is level with the work surfaces in the room. While the previously mentioned options are excellent for slideshows and photo montages, watching a full-length feature is always better with a larger surface. With a portable free-standing cinema screen, any regular room can be transformed into a fully-functioning theater in a matter of seconds. A cinema screen is great to have around for a rainy day or student film festival. What kind of projection screen is permanent? When one particular room requires a clear presentation surface on a regular basis, there is no need to have a mobile model. 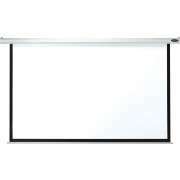 Pull-down projector screens are great for classrooms or conference rooms because they are always there when they are needed. There is no need to coordinate with other teachers to figure out whether the surface is available when it is needed for your class. Additionally, the screen rolls up into a wall-mounted case so it won&apos;t get dirty or damaged when not in use. In a professional setting, walking over to manually pull down the screen in the middle of a presentation can distract conference attendees. 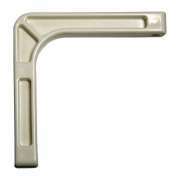 A motorized model offers the same wall-mounted convenience without requiring any movement or manual labor. With the touch of a button, the screen will slowly roll into position so everyone can appreciate the details and intricacies of the slideshow. 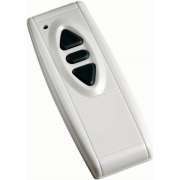 A motorized screen becomes even more convenient when paired with a wireless remote. 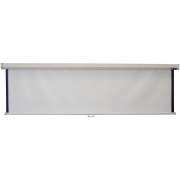 With this arrangement, the projector screen can be controlled from virtually anywhere in the room. This is the most professional arrangement because no one will even see the behind-the-scenes action as everything is perfectly synchronized out of the view of the audience. Hertz Furniture&apos;s projector screens are designed to help you bring technology into the classroom or office in the most efficient way. Our compact models provide a clean surface for presentations, movies and pictures so you can have a professional-quality seminar or training session. For help determining the ideal screen size for your equipment, audience and space, contact the experts at the Hertz Design Center for free project-planning advice.